Michelle and I have been wanting to make pupusas for quite a long time now but we don’t have a food processor, which makes things very difficult. Sure, we could go out and buy a cheap food processor for $100, but the one we want (to match with our Candy Apple Red KitchenAid blender) is about $500 and spending that kind of money on kitchen equipment is just not a priority for us right now. 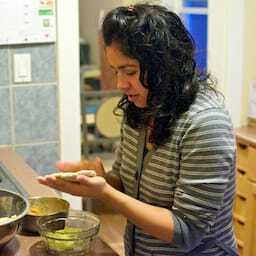 And finally this weekend we decided to buy some maseca and make pupusas. I made the cheese mixture, chicharron, curtido, tomato sauce and masa, but in terms of actually assembling the pupusas, I needed Michelle for that. This is one dish that we can only make together! I was very impressed with Michelle – it’s been a long time since she’s made pupusas but you wouldn’t know that from looking at them. 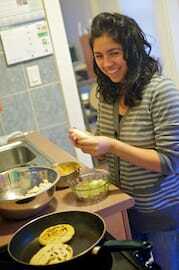 And in terms of taste, they were easily some of the best pupusas we’ve ever had! Someone should have told the poor guy what the alternate/slang meaning of "pupusa" is. Maybe then he wouldn’t have said "the pupusa is loose-ah" or "…the pupusa? Enormous! All I need here is a small bed…" LOL that’s hard to forget – I’m sure it will now stick with you too! It took me a while to find that video and it was only available in the states (and not the greatest quality) so I had to work at it to get it up on here, but I think it was worth the effort – it’s just too funny to pass up, no? 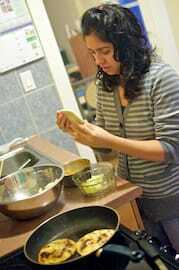 Michelle Making Pupusas was published on Wednesday, March 7, 2012 at 4:30pm EST by Daniel Menjívar and last updated on April 11, 2018 at 9:30pm UTC .